Reply 1 . Will wait for Update as you have the direct line to the Answer. Reply 2. Thank you so very much; Everything helps. Yes - Everything is hand drawn and original. ? ? I was looking for "Terms" Let me explain . . . No , there is to much. I will sum up. Um. . Bonus art implies. What Fair use is or covers. How a hand drawn Visual Guide Sheet should/could be shared and how a VGS completed by another artist should be catagorized. When I hand draw two things at once they are different non-tech involved pictures, but may look the same. Not bonus, traditional ? ? The Pini's have opened up their world at lot more now than 10 yrs ago. - Still I wish to tread lightly, as if I was in their home. "Fandom is at their sufferance." was our clubs Motto. All the changes are exciting - sooo I just don't want to go off half educated. This Site is very respectful. I like your guys' Style. I am very New to On-line Fandom. I wish not to offend. Just color me Confused and not t-literal enough to explain. I am waiting on a reply from Richard Pini with regards to the question you posted earlier about the Wolf Logo/Fan Art/Imaging, so hopefully I can give you more info about that soon. Bonus art implies. What Fair use is or covers. How a hand drawn Visual Guide Sheet should/could be shared and how a VGS completed by another artist should be categorized. When I hand draw two things at once they are different non-tech involved pictures, but may look the same. Not bonus, traditional ? ? The Pini's have opened up their world at lot more now than 10 yrs ago. - Still I wish to tread lightly, as if I was in their home. "Fandom is at their sufferance." was our clubs Motto. All the changes are exciting - sooo I just don't want to go off half educated. Bonus art is something that was done for the 2012-2014 EQFA planners and as for the other stuff, just post and if you are really unsure you should be posting an item you can always drop one of the mods or admins a PM and we can help you. If you do happen to post something that we think shouldn't have been posted we will let you know and you (or we) can take it down. We are a pretty easygoing bunch. Thank you, we are happy to have you but you really don't need to be as concerned as you are, just use your own judgement and if you are really unclear about something just ask. I was wondering if it's okay if I made a folder in my gallery in which I'd post photos of wolves. Only ones I made myself of course, and for the purpose of reference pictures for everyone on this site to use. R - Art Trades. Although I have no drawn art to trade at this time, I wish to know if anyone would like to trade some of their Calendar drawn Art for a 3D Model of Cutter ? ? I believe I have 4 pours left after a limited run of Twenty and I would just love to see them put together and painted by different Artist and Artisans. It is a 9 piece Model Big enough not be intimidating to put together. My Deviant site has pictures, so please look before you leap, an realize the cost of shipping for this Trade could be up to 35 $$ if you are over seas. Maggie - Does this qualify under the Art Trade Rules ? ? ? Before bartering was forbidden ,as a profit, was made. Hi Tah-Marien, I hope it's OK for you and Maggie, if I answer your question. I (speaking for Warp) don't mind if someone does a commission sketch at a convention. I don't mind if, in the course of an artist's work for Warp on EQ, they want to unload some of their original art pages. I do mind, however, if someone gives the impression that they are in the business of doing EQ art for others. I do like the notion of freedom of expression with respect to fan art and fiction. I do not like the notion of someone using EQ for personal gain in such a manner that it appears we've given permission (explicit or implicit). 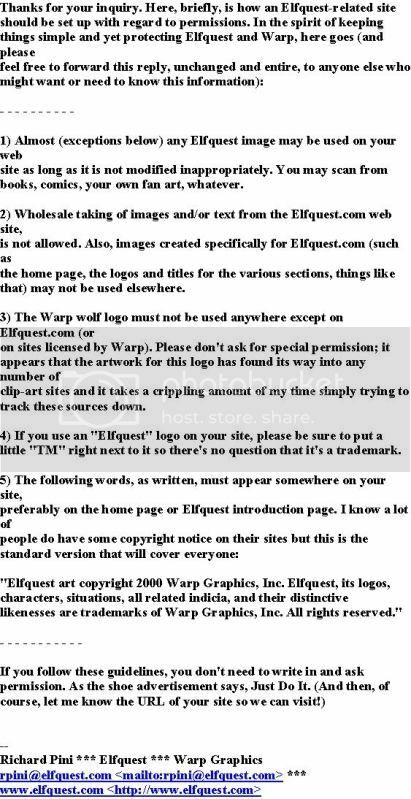 So, in a nutshell, WaRP does not give permission to offer paid commissions, or sell fan artwork, of ElfQuest copyrighted material for pay. If someone feels they have a situation which may warrant an exception, then you can PM Richard over at the elfquest.com forums, or send him an email (I believe rpini_at_elfquest.com still works). In general we have no qualms with posting sales, or offering paid commissions for, original characters. Whether or not any of your original characters run a risk of infringing on the ElfQuest copyright is not a gray area we are going to impose ourselves into. So, Tah-Marien, an art trade for non-profit reason should be OK with original EQ characters. If you really just charge the shipping cost, I don't really see much of a problem. Maggie, please comment, if you feel that this could be problematic. NEW - Question Maybe a prescribed drug haze has left me loopy ! I cannot for the life of me find a way to Submit more ART. I know I Have submitted in the past , so I is very confused. " Posting " Does not cover Gallery. Where or where do I go and why can't I find it. I am very confused ! ! Click on the "gallery" button at the top menu. When you're logged in you can see the option "my albums" on the right. Go there and click on the album you want to add a picture to. In there you can find the option (on the right) "add an item to this album". This is how I always do it (there's a more elaborate way to go through the members list and find yourself there), if anyone knows other/quicker ways, please enlighten us. Thanks afke! That's really helpful. There are other ways, I think, but this might be the most easy one. I should make a mental note to make a guide with pictures once. Question ? ? More of an suggestion really. FOXEYE did an amazing Monochromatic picture of MoonShade. I would suggest that we add the catagory on/in "Challenges"? What a wonderful challenge idea and a great example to live up too ! ! Anyone ? Good idea. It might be best to save a new challenge for after the calendar though. That is for the Best I agree. Otherwise I will try to finish one more thing in stead of working on my Comic page. You are Wise. Your challenge idea is a good one though, so I will make sure to post it once this calendar business is done. Heya! Berit has done the Marut thing and wandered around for quite a long time! but now I'm back! and let's start with two questions that might be obvious to others, but I need to ask..
Hey Berit glad to see you back at the site. Gore, hmm, well I don't have a problem with it, maybe just tag your art to let folks know there's gore to be seen. As for the doll thingies etc, if it's EQ post it to your gallery if it isn't then put it with your non-EQ stuff. If it is based on EQ (your original characters) then to your gallery as well. I'm sure I am probably contradicting some rule posted somewhere but I am an admin so I can get away with that...tee hee.